I am auctioning myself to wear your company’s shirt for 3 days during the Affiliate Summit West Event January 2013 in Las Vegas. This is a special year. If the auction goes over $5,000, our T-Shirt charity auctions will have raised more than $65,000 !!!!!!!! All of the proceeds go to Matt Talbots Kitchen which feeds the homeless, in the name of the Affiliate Marketers Give Back foundation which is a non profit group lead by Missy Ward (Affiliate Summit Co-Founder). This is a HUGE oppournunity to get your company out to a very targeted audience. I normally take between 50 and 100 pictures with people and this year we will be doing video again interviewing people in the expo hall. At Affiliate Summit West 2009 I agreed to wear your companies logo EXCLUSIVELY at Affiliate Summit west and the auction ended up going for $10,000 !!!!. 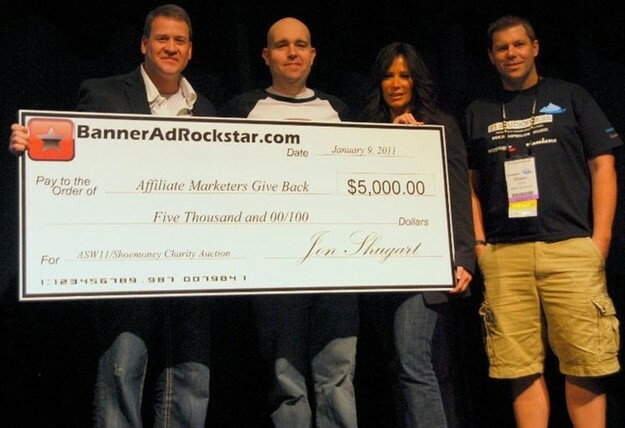 Once more a year ago at Affiliate Summit West 2010 I held an auction that raised $10,100 for the People’s City Mission again, the high bid coming from ClickBooth. 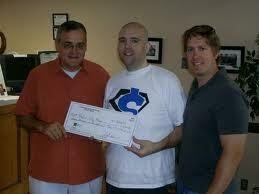 Its really been awesome raising over $50,000 at Affiliate Summit events by wearing a companies t-shirt. But now its 2012 and I want to crack that $65,000 for charity mark!!!!!! This is a great chance to get your brand out there and also support a GREAT CAUSE! You will receive a TON of exposure. And A LOT MORE than just a handsome model wearing your logo! At Affiliate Summit this year we have gone through all the background checks, union agreements, and other hoops to be one of very few people allowed to take video inside of Affiliate Summit West. I already have about 15 companies booked to interview them about their services and also will be doing some general video. I also am asked about 10-20 times to be video interviewed (nobody is supposed to shoot video without authorization people will do it outside of conference areas) and your shirt will be shown. I have over 10,000 YouTube subscribers and am by far the most subscribed to person in this niche. All of the subscribers get alerted each time I upload a video. Each of my videos also has a chance of being syndicated by techcrunch/mashable or another large HUGE website and giving your company more exposure. My photo gallery is the most visited section of ShoeMoney.com other than the root domain. Check these stats out from the last year. But besides the TONS of photos I will have in my own gallery, there will be loads of them on flickr and Facebook that people will tag and they’ll be seen by many. That’s cool man congrats thanks for setting an example. Are you speaking this year again? Damn… I wanted to hear you this year. Hey Jeremy – good Karma. As the founder of a charity event that has raised over $15K in 3 years, myself, I know first hand just how gratifying this must be for you. I bet this is a scam . You’re a good man Shoe, good man indeed. honestly tho Rod how are you going to what kind of traffic you get from this? Im sure you will get quite a bit but the main thing is that you are giving back to the community that matters most. Awesome Work Shoe! Hope you reach the $65,000 mark no doubt you will cant wait to see the T-shirt you will be representing! Awesome stuff Shoe, I am sure you will be able to beat the $5000 mark. Good luck!! This is so cool. and Congrats!! Do you get a lot of bidders? So cool! and so respectable. Pingback: Lawrence Tam Makes Over $100,000 In A Few Month’s Time… « Just Spit it Out Already!